Do you know how hard it is to find people who really know about potbellied pigs? If you already share your home with one, chances are you do. But look no further, because The Grange is home of the pet pig. You probably know that there are not a lot of products on the market specifically designed for pet pigs. That’s okay because more than just supplies, our staff members have real pig experience. Since we know what potbellied pigs need (nutritionally, emotionally and physically) we’ve created a selection of products that are perfect for Potbellied pigs. In addition to the full line of Mazuri Mini Pig Feed, we have the best feed bowls, toys, treats, and health supplies for potbellied pigs. Plus, if you have questions about balancing a diet, treating parasites, dealing with a behavioral issue or trimming a hoof, we have answers! 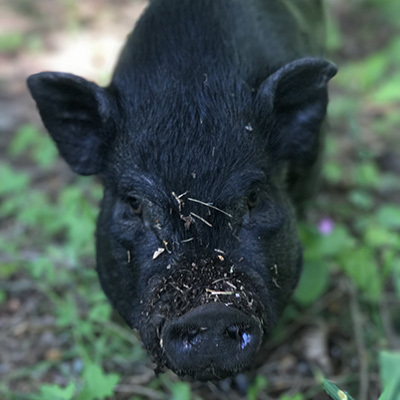 If you found our page because you do not have a potbellied pig yet and are considering adding one to your family, come see us! Potbellied pigs are wonderful animals with very specific needs. Unfortunately, there is a lot of confusing information on the internet regarding pigs and we want your pig experience to be nothing less than wonderful. There are not a lot of pet stores in Western Washington that really understand potbellied pigs… come learn with us!